This is a very traditional and popular Japanese dish. 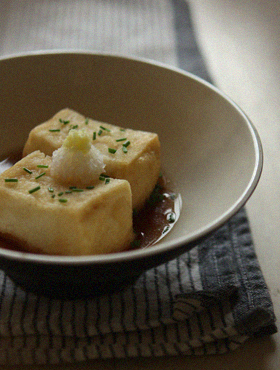 Deep-fried tofu with dashi-based sauce. Dashi means ‘Japanese soup stock’, and it’s the most important element of the authentic Japanese taste and many Japanese dishes include dashi. Classic dashi is made using dried kelp and dried bonito flakes, and it’s not difficult to make, but I guess it quite difficult to get right ingredients for dashi in the UK. Instant dashi powder is available in most oriental grocery shops, and if you are vegan “konbu dashi” is also available (konbu means kelp seaweed). Usually, 1 teaspoon of dashi powder is used for 2-3 cups (400ml to 600ml) of hot water. 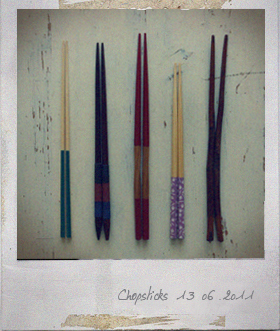 So, if you know what is dashi, then you can make miso soups and so many kind of Japanese dishes. Itadakimasu (“bon appetit” in Japanese). To make the sauce: place the dashi, soya sauce, mirin in a small pan and heat gently. Keep the sauce warm until ready to serve. Cut the tofu into 6 even blocks and coat them with the corn flour. Heat the oil to 340F, and deep-fry the tofu until light golden, place it on kitchen paper to remove excess oil. Place the deep fried tofu on a plate and pour the sauce over and garnish with finely chopped chives, grated mooli radish and grated ginger. § 6 Responses to Agedashi Tofu"
Lovely! I really like Agedashi Tofu. You are currently reading Agedashi Tofu at Fish Trip Cafe.